Another clue has emerged as to why more than 140,000 ballots were rejected in the Scottish elections. BBC Scotland has established that voters in two of the biggest cities did not receive the ballot papers they had been led to expect. The papers had been redesigned after the nominations closed to cope with the high number of parties and individuals. The rate of rejected Holyrood ballots was high across Scotland but highest in the Glasgow and Edinburgh areas. The BBC's Newsnight Scotland programme has established a significant link between this high number of rejected papers and a decision taken soon after nominations closed to change the ballot paper. In Lothian and Glasgow, no fewer than 23 parties and individuals were vying for the list vote. 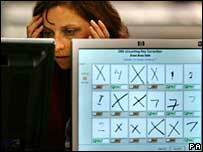 It was feared there would be too many on the ballot paper to permit electronic counting. So in both regions arrows designed to help voters put one cross in each column were scrapped. It meant thousands of voters went to the polling booths expecting to see one design of ballot paper and were faced with another. In the 2003 election, the list vote for Holyrood said there were just over 1,200 rejected ballots across Glasgow. In this month's vote, there were 9,000 and the differential in the constituency vote was even bigger. The city had eight of the 10 constituencies with the highest number of rejected first-past-the-post votes, and seven of the top 10 for regional votes. Dr Christopher Carman, of the Department of Government at Strathclyde University, said there were "distinct differences" across the different regions. "As this has developed and as we have been able to gather information our models now clearly show that this regional variation can be attributed to the number of parties on the regional lists," he said. Professor James Mitchell, of Strathclyde University, said a system with two ballots on one paper worked elsewhere. "It didn't work in Scotland, and we have to explore why that is," he said. "It seems to be that the instructions on the ballot paper were not adequate for the job, but in some places they were even less adequate than others, so we have got regional variations. "In principle there is nothing wrong with it, it is an implementation failure." The Scotland Office, which was responsible for the election, said it was waiting for a review by the Electoral Commission. A Scotland Office spokesman said: "The Electoral Commission today announced the appointment of the electoral expert Ron Gould to lead an independent review of the Scottish elections. "The design of the ballot paper will form a significant part of that wide-ranging inquiry with which the Scotland Office will co-operate fully." Mr Gould, a Canadian expert who has overseen elections in more than 70 countries, said: "I hope my review will help ensure that the people of Scotland can be confident that any lessons are learned for the future." Professor David McCrone, of the Institute of Governance at Edinburgh University, said: "Someone should carry the can and indeed a number of people are going to have to carry the can. "One of the difficulties is that it is not clear who has responsibility for this. "There is a large number of crossed wires in this whole exercise and all that's going to have to be sorted out."